SimplyHome was honored to be a part of this tech summit. Our very own Allen Ray, SimplyHome CEO is featured in this photo. We look forward to providing technology to improve services provided in NC. 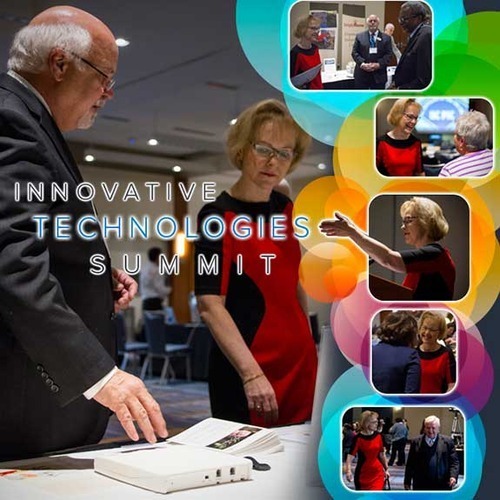 Department of Health and Human Services Secretary Aldona Wos on Wednesday encouraged more than 150 behavioral health advocates and specialists attending an Innovative Technologies Summit, to use technology, innovative thinking and teamwork to meet the care needs of North Carolina’s citizens with mental illnesses, intellectual and developmental disabilities and substance abuse disorders. Technological advances in behavioral healthcare were highlighted and demonstrated at the one-day conference at the Raleigh Convention Center. The conference was organized by the State Division of Mental Health/Developmental Disabilities/Substance Abuse Services and the Governor’s Institute on Substance Abuse. In a welcome to conferees, Wos emphasized Gov. McCrory’s passion for innovations and technology and concern for our citizens who have behavioral healthcare needs. "Today we bring together this passion for innovation with our vision of improved services in our state for citizens with mental illness, substance abuse disorders and developmental disabilities," Wos said. "We are looking for better ways to do business, better ways to provide services, and better ways for our citizens to access the services they need." Wos directs the many divisions of DHHS to work together to bring more technology to bear in the delivery of health and human services. The conference attracted top speakers who discussed how North Carolina can take advantage of technology to provide care for citizens in need of services and supports for mental illness, substance use disorders, and intellectual and developmental disabilities. Presentations on innovative technologies included smartphone applications with GPS and interactive messaging, avatars that can offer brief intervention strategies, and smart home technology with adaptive equipment built in and geared toward an individual’s needs. This technology is used to empower and support individuals to live healthy and independent lives in the community. North Carolina strives to remain a leader in progressive technologies as a means to support prevention, treatment, recovery, and habilitative care. Coordinating technological systems across healthcare agencies as a means to enhance care for the individuals served. Wos praised the passion for innovation demonstrated by some of the speakers who are top leaders in their fields, including H. Westley Clark, director of the Center for Substance Abuse Treatment within the U.S. DHHS Substance Abuse and Mental Health Services Administration. He leads the agency’s national effort to provide effective and accessible treatment to all Americans with addictive disorders. He discussed the role of electronic health records as a tool for improving care. Clark praised North Carolina for dedicating $4 million for telepsychiatry to meet the needs of individuals where few psychiatrists practice, particularly in rural areas. DHHS’ Office of Rural Health and Community Care is responsible for administering this appropriation made by the General Assembly. Another speaker, Melissa Pinto, assistant professor at Emory University, participated in a team that piloted a three-dimensional, avatar-based program that immerses young adults into a virtual primary care environment. Through the program young adults interact with virtual health care providers and health coaches to practice effective communication about depression symptoms. The technology generates tailored feedback to the participant’s responses. Rodney Bell, representing the Coleman Institute for Cognitive Disabilities at the University of Colorado, and is an independent consultant in technology management, discussed his software company’s mission to advance the effective use of emerging technology in service of social needs, particularly to promote the quality of life and independent living of people with cognitive disabilities. Wos encouraged all stakeholders to consider using more technology as a means to enhance outcomes for individuals served. She also noted that these measures offer more opportunities for self-direction and autonomous living in the community. She praised the speakers and urged providers and innovators alike to help North Carolina find the most economical and effective ways to meet the needs of its citizens. "Your efforts will allow people to live more independently," she said. "I believe that if we work together, we can develop system supports that promote independence and self-sufficiency using technology," she said.